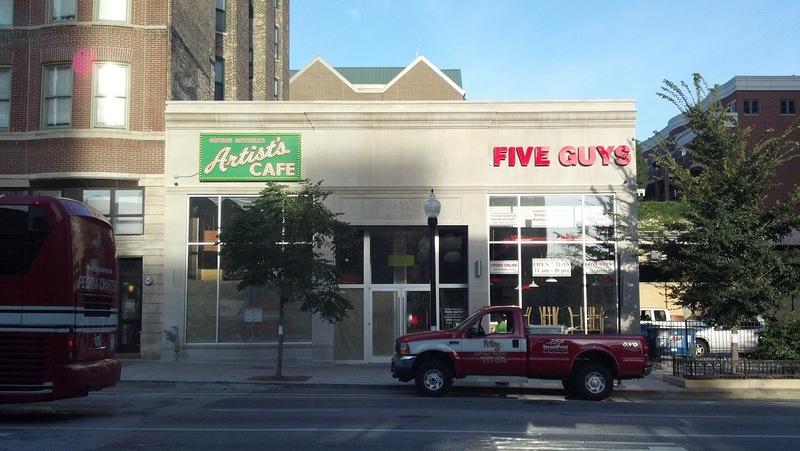 Sloopin - A South Loop Blog: Artist's Cafe Sign Goes Up; Opening Imminent? We knew that Artist's Cafe was going into this space, but it's still exciting to see the sign go up. You can also get a good peek into the restaurant and it looks much more funky and contemporary than the restaurant on Michigan. Anyway, we still haven't heard anything about an opening date, but hopefully it's coming soon. Anyone hear anything about this? Very cool. Prob a dumb question, but are they closing the one on Michigan 6-7 blocks away? No this is a second location. I think that the menu is bling to be different as well. If they were smart they would have put in a self-serve yogurt or bakery. Something complimentary to Five Guys, not something that is going to compete with it. From what I understand it does not compete with Five Guys. The menu has soups, salads, sandwiches and wraps. They also have homemade baked goods and gelato. I had lunch there today and the food was awesome and the chocolate chip cookie and coffee were really good.